You are Altair bin La-Ahad. The once naive assassin has become wiser, yet he is as deadly as ever. 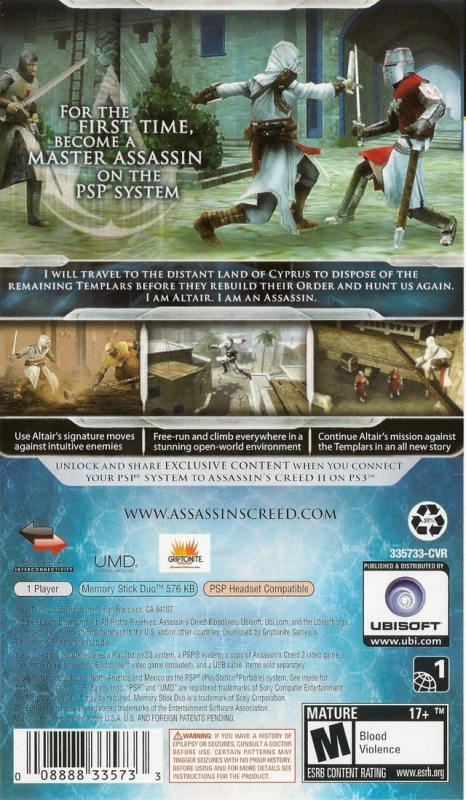 Altair has followed the few remaining Templars to Cyprus to finish them off. Besides the already familiar Acre, the game only features two locations, Limassol and Kyrenia. 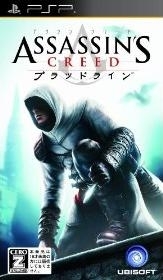 Although these historical places are visited via the Animus, Desmond Miles is not present. 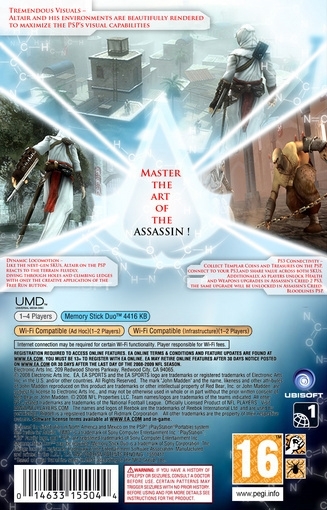 The game starts with Altair capturing the Templar Maria, whom he had spared in the original Assassin’s Creed. She wishes nothing but death for the assassin that ruined her reputation, but the Templars want both of them dead. The good news is that if you‘re familiar with the controls of the original Assassin’s Creed, then you’re not going to have any problem whatsoever getting used to the controls. A good 10 minutes with the opening tutorial will quickly refresh your memory. However, the bad news is that this is the only good news. 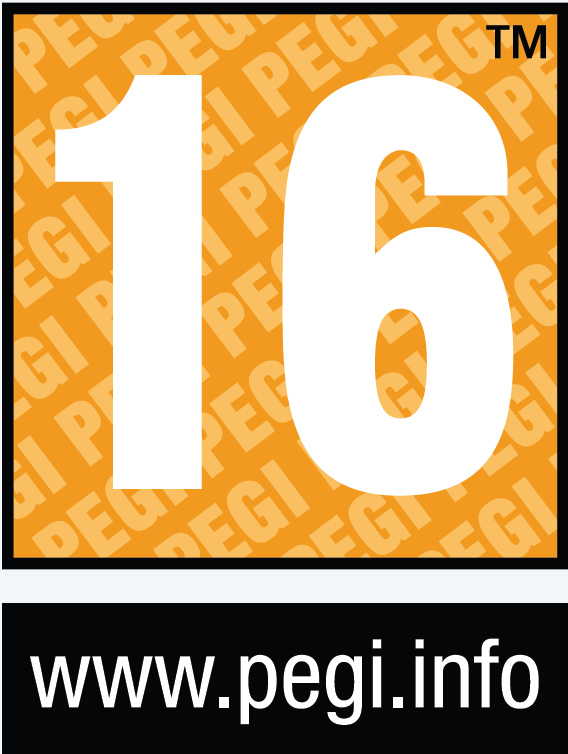 Those who are new to the game will quickly become frustrated, as the controls are technical and unwelcoming. Without the analog stick, maintaining a well focused camera angle is difficult. Staying on the move while maintaining the camera angle is even more difficult. Just as you have to hold the R trigger down to turn the action buttons to high profile actions, you have to hold down the L button to turn them into camera manipulating controls. A good hour into the game I gave up on trying to keep the angle to my liking and started to simply tap L to default it. The camera angle is awful. The combat system is exactly like Assassin’s Creed. You start off with all the same weapons and the same D-pad mechanism to choose between them. You have the dagger, sword and throwing knives. The throwing knives are completely pointless. Then again, except for the handful of boss battles where the sword is somewhat necessary, the sword is almost similarly pointless. You can literally finish the game by countering enemy attacks with just the dagger. I tried to give the sword a go with the combos to see what sort of new kills Altair can pull off, but unfortunately they were the same ones we’ve seen over and over again in the first game. Even the counter attacks are the same. 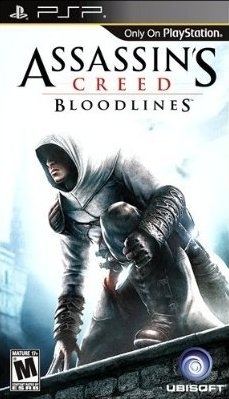 If you were one of those people who disliked Assassin’s Creed because of its repetitiveness, you’re going to love this. The missions you’re tasked to perform in order to advance the game are, again, exactly the same. You can sum up the missions into: kill the targets (assassination missions or rescuing civilians by also killing) and interrogating people. 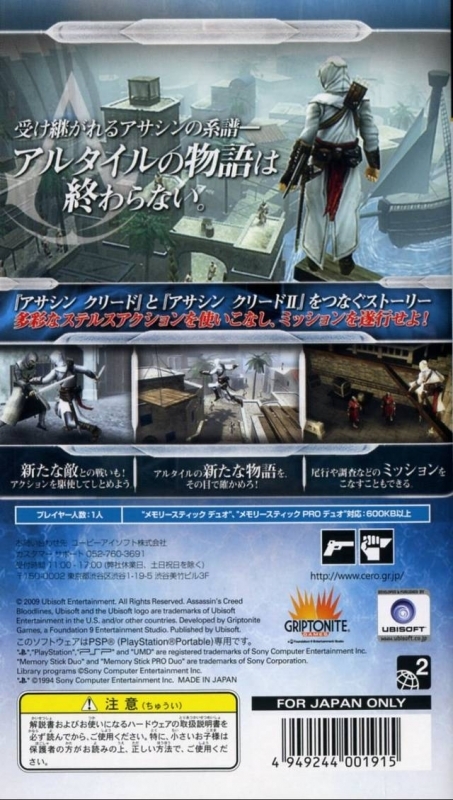 Unlike the original game though, the side quests are few in number and just a means of gathering Templar coins, which are the game’s currency used to update Altair’s weapons. The graphics and visuals are impressive. Except for the guards outnumbering the civilians, the atmosphere is pretty much similar to what we saw in the first game. You have the Templar knights in their shiny armor, and the newly introduced shirtless pirates that add some variety to the types of foes you can encounter. 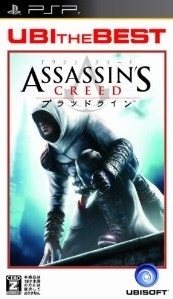 Besides the unclean shave, Altair looks pretty much the same. The scenery is still nice, and you still have the viewpoints to enjoy it. The game can be finished in 6 hours. Unless you’re going after the accomplishments, this game has no replay value. Accomplishments are pretty much in-game achievements that consist of killing certain targets or collecting all of the Templar coins. 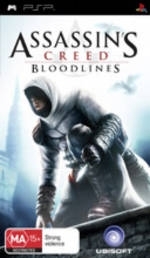 There’s a feature that allows you to connect to your PS3 in order to exchange Templar coins between Bloodlines and Assassin’s Creed II, or learn new abilities. 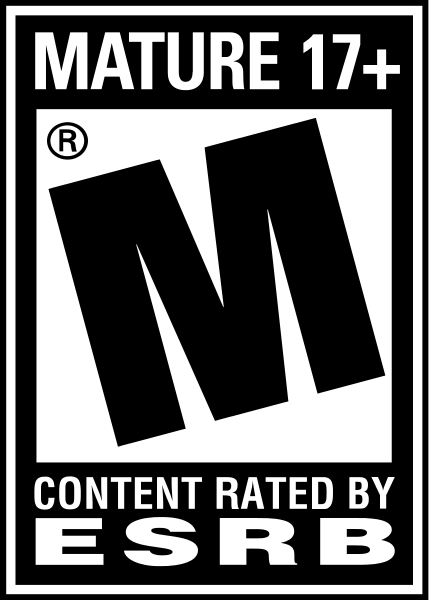 An install option is also available at the start of the game to shorten load times. 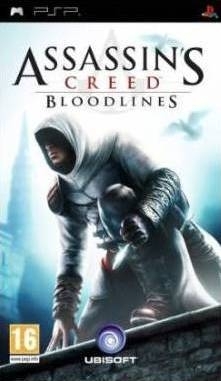 Assassin’s Creed: Bloodlines offers nothing that we didn't already see two years ago, and unless you’re a huge fan of the series, this game is not for you. If anything, this game is nothing but a downgrade from something we’ve already enjoyed. 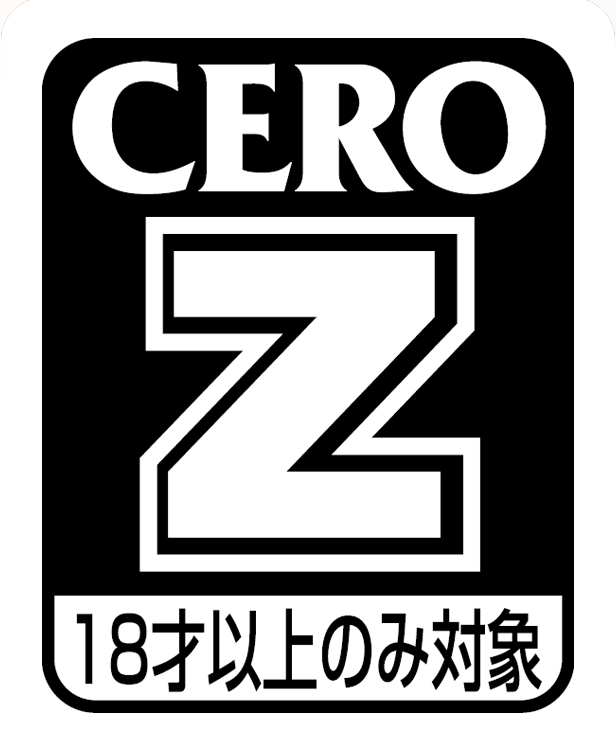 I’ll go as far as saying that I don’t even suggest this game to fans of the series.